You and you partner have bonded over many things from the very beginning. There are those Sunday morning bike rides where you showed each other your favorite parts of town. Then there's the time they nursed you through that cold last winter. Most of all though, it's those simple summer meals on the porch when the bacon meets the tomato and lettuce making a perfectly satisfying combination. Hmm, much like your fresh and satisfying relationship. Strange craving begin happening as soon as the summer rolls around, maybe you're innocently getting out of your car after a day of work when you smell it, the first grilling session of summer. You can't help but want to follow your nose and make some new friends. There is something about the warm air that just makes us as humans want charred meat. When you and your honey, or your best friend, for that matter are sharing those summer nights together there's no better food than delicious charred bacon, juicy tomato, and perfectly crispy lettuce on mayo coated toast. 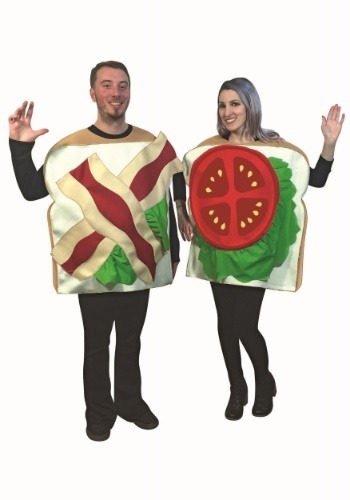 This Halloween wouldn't it be wonderful to celebrate the sandwiches of those muggy summer evenings with this couple costume? This colorful costume isn't limited to Halloween. You and your partner can use this costume to add some comic relief while you're crashing your neighbors grill out, after all, if you have to smell their delicious sausages from half a block away they should at least give you one. Or you could be a normal couple and wear it to a costume party. . . or you two could wear it to one of the many bacon festivals around the world. Hmm, much like the sammy this costume seems to satisfy your costume cravings in many different situations.